OMTEX CLASSES: There is no relationship between marginal utility and total utility. Ans. No, I do not agree with this statement. Total utility is the sum of all utilities derived by a consumer form all units of commodity consumed by him. Whereas Marginal utility is the addition to the total utility derived by consuming an extra or additional unit of a commodity. In other words, marginal utility derived from the consumption of an additional or extra unit of a commodity. The following illustration of a schedule and a diagram explain the relationship between total utility and Marginal utility. 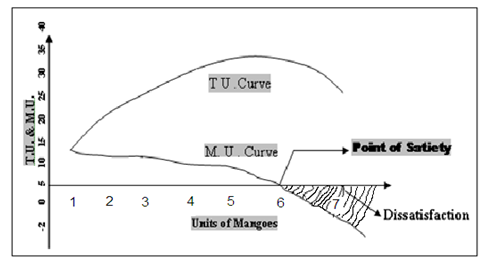 Let us assume that an individual consumer Mr. ‘X’ found of mangoes and start consuming unit of mangoes in quick successive unit of mangoes. 1. Mu goes on diminishing as the consumer consumes more and more units of a commodity. And TU increases but, at a diminishing rate. 2. There is an inverse relationship between MU and stock of the commodity i.e. as the stock of the commodity consumed increases, MU goes on diminishing. 3. When MU is Zero, TU is the maximum and it is the point of maximum satisfaction. i.e., point of satiety. When Mu becomes negative, total utility starts diminishing. This is the area of dissatisfaction.